Beijing comes across as a pastiche of cultures, constructions and niches. One way to peep through this car choked, city going global is to take a Hutong tour. Hutongs are narrow alleys and streets linking the ancient courtyard houses or siheyuens to the expansive roads of the present. 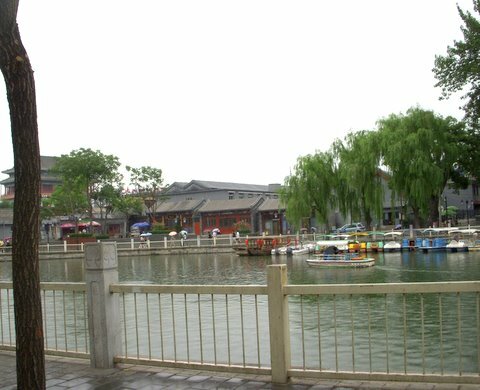 A few have been preserved as “Potemkin”1 hutongs or tourist attractions and the Shichahai hutongs fall in this category. We took pedicab from the north gate of Beihai Park to the Lotus Market, opposite to Shichahai. From the main gate we hired a cycle rickshaw and rode past the narrow alleys and the carbonated Bar Street lined with pubs and restaurants overlooking the Qianhai Lake, which gave us a pleasant glimpse of old Beijing. A continuous drizzle and swaying willows along the lake added to the vibrancy of the moment. At one point we were in a rickshaw jam of tourists, and finally the rickshaw queue arrived at the shoe-shaped Silver Ingot or Yingding Bridge at the north end of Qianhai Lake. The place was overflowing with peddlers, pedestrians and different types of vehicles. From this point, we walked towards the landmark seven hundred-year-old Drum Tower, paid to enter, and got a view of the old living quarters, crowded alleys and stores. The Shichahai hutongs, in the ‘Ten Temple Lake’ area close to the Forbidden City and Beihai Park, date back to the Jin Dynasty (1115-1234), preceding the city of Beijing. The area covers nearly 363 acres inclusive of the three man-made lakes that at one time served as water system to the Forbidden City and are now fascinating scenic attractions. Though much has changed, one can still view vestiges of an ancient lifestyle in the newly paved hutongs/alleys: cyclists, mah-jong games and an elderly woman pushing her three-wheeled cart. Most houses look newly painted, with enterprising moving in to live the hutong life and work in traditional businesses, while other houses were ramshackle and seemed in need of new takers. Missing were the peddlers that once made hutongs famous. To the west of Yinding Bridge are the Dajinsi and Xiaojinsi hutongs and the famous 232-meter Yandai Xieje (Tobacco Pipe Lane) which resembles a pipe, and at one time was notorious for its market of long-stemmed pipes. 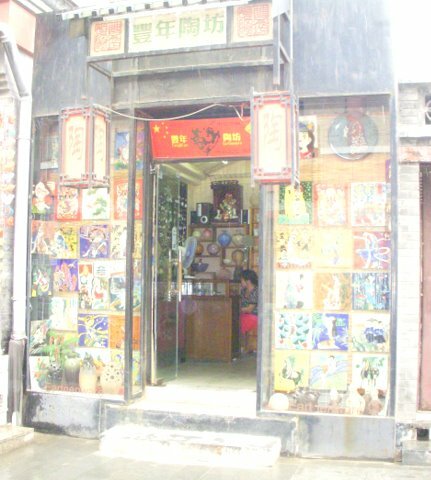 The hutong was refurbished in 2007 and the stores, with unique facades, sell diverse products from Indian textiles, Miao costumes, Tibetan artifacts and Chinese tea to paintings, art material, paper products and gifts. Some residences are converted into restaurants, pubs or hotels by their owners, mostly younger generation, who have realized the tourist potential of hutongs. One of the historic and cultural places on our list was the intricately carved Guanghua temple built during the Yuan dynasty. Other places of interest were the grand mansions of opera dancer Mei Lanfang and writer Guo Moruo as well as Prince Gong’s mansion and garden on Liuyin Street. For a visitor, the Shichahai hutongs, with their different lengths and width, are confusing mazes, and unless carrying a map, it’s easy to end up going in circles. The reasons for the intricate layout of hutongs were the additions and subtraction of siheyuens and hutongs during different dynastic rules. ‘Huto’ is a Mongolian word meaning ‘water well’ and the Mongols referred to the alleys around these wells as hutos. In the Yuan dynasty life revolved around hutongs or water wells and the standard of hutong was set as six steps or nine feet depending on the size of the steps. Today, nine feet is not even a blot on some of the newer expressways or city avenues that replaced these traditional arteries. During the Ming Dynastythe center of rule was in the Forbidden City surrounded by concentric social circles. The nobles and upper classes lived closer to the center of power and their siheyuensand gardens overshadowed the abodes of the less fortunate and plebeians relegated to the outer circles. The haphazard construction of hutongs during the Ming and Qing dynasties resulted in hutongs loosing out on their ‘feng shui’ orderliness and cleanliness. Further change was witnessed during the beginning of a new era in Chinese history (1949) when avenues and streets replace hutongs and siheyeuns divided and sub-divided to accommodate China’s growing population and industrialization. For a simple tourist visit there are pre-booked hutong tours or on the spot tour guides at the entrance itself. The touts lurk everywhere. But to savor the exotic serenity of the Shichahai lakes and take a ride on stately gondolas reminiscent of Chinese paintings depicting “porcelain” court figures or watch the lights ripple on the Houhai Lake from its many bars and restaurants, it is best to do so alone. For locals, the Shichahai hutongs are an habitual life style but for a traveler, they are a connection to twelfth-century China. Thank you for touring hutong! It has such a long, rich history. Sounds a lot like Old Delhi. although I guess it must be cleaner. I cannot find your About page – but thank you so much for the follow! I hope you will not be disappointed. I will visit you and make myself comfortable!